Happy Easter weekend, and welcome to Digital Digest! This week, we've got all of your regular features, and we get to see a reunion (of sorts) for the Clampetts in a review of The Return of the Beverly Hillbillies. Let's get going! "There are master-quality and clearance issues that need to be resolved, but the outlook is positive and a release likely at some point." Of course, this doesn't mean that it will definitely show up, but for anybody who is curious, responses similar to this were given not too long ago regarding Alice and Eight is Enough, both of which were released (and not very much later after that). There has been one nice new addition to the lineup on the website Hulu. The service recently added ten episodes of the rare sitcom My Living Doll. While it is the same ten episodes already released on DVD, this gives a new audience a chance to watch this surprisingly excellent series. Original series have slowly been becoming a part of online streaming video websites lately, and Crackle has been finding success with this as well. This week, Crackle announced a second season of their original thriller series, Chosen. The first season stars Ventimiglia as a husband, father and lawyer who awakens one morning to discover a mysterious box on his doorstep containing a loaded gun and a photo of a stranger he is instructed to kill within the next three days. Production of the second season will begin this summer. Tuesday (April 2) is not a big day for releases, but Shout! Factory does have one release, with Route 66 - The Complete Fourth Season. In the early days of television, CBS was always the "king" of television. In 1962, The Beverly Hillbillies debuted on the network, and over the next few years, the series became one of the many series that defined CBS as the "rural" network. Despite that "rural" label, the series were much beloved and successful... until changes came in the early '70s. In the 1970-1971 season, CBS debuted The Mary Tyler Moore Show and All in the Family, and by the end of the season "everything with a tree" (as Pat Buttram of Green Acres once said) was cancelled. In 1981, though, CBS decided to bring back those Hillbillies for a bit of a reunion. Of course, not all reunions can be perfect. The main cast of the series consisted of essentially six actors and actresses during the original run. By the time this movie came around, two of those cast members had died, one refused to participate, and one only minimally participated. In the end, Paul Henning (with his hands already tied by a writer's strike) ended up creating a movie focusing on Jed Clampett (Ebsen), Jane Hathaway (Nancy Kulp), and Jane Hathaway's new boss (Werner Klemperer). No longer is Jane Hathaway the assistant at Beverly Hills Commerce Bank. She has moved up in the world... WAY up to the White House, where she now works for the government. Jed is no longer living in Beverly Hills (due to the budget being too low to afford to use the original mansion...), and has given all of his money to Jethro and Elly May, while he is back in the country. Granny (much like Irene Ryan) has passed away, but fear not, Granny's Maw (Imogene Coca) is now suddenly part of Jed Clampett's everyday life. The plot of the movie focuses on Jane Hathaway trying to get the recipe to Granny's moonshine due to the powers within it... specifically, the power to solve the country's energy crisis. The movie has a runtime of 1:35:59. The main menu has the movie theme song playing in the background, along with options of Play, Play with Introduction, Special Features, and Episode Subtitles On/Off. Selecting Special Features brings up a menu where all of the special features are listed on one screen. Chapters are placed throughout the movie. I really did expect the worst for the video and audio quality on this DVD, but actually it is pretty good. There is a little bit of grain in the picture, but the video quality is mostly pristine. There is a mono audio track that isn't extraordinary, but it certainly does the job. The movie contains English subtitles. Of course, MPI is well known for their special features on their releases, and there are plenty of these on this DVD. Admittedly, though, most of these are "repeats" from MPI's previous releases of the series... but that isn't a huge deal. First, there is an introduction to the movie (11:01) where Linda Kaye Henning (daughter of Paul Henning) gives her introduction to the movie. "Paul Henning and the Hillbillies" (51:20) is a feature that talks about Paul Henning's life and the series, with interviews from those who knew him well (including Max Baer). Cast Commercials (10:05) gives a lot of cast commercials from the episodes of the first two seasons... but fans will notice that they only included the Kellogg's commercials here (none of the Winston Cigarette ones). Promo Spots (3:22) is a series of CBS commercials for the series, all of which are from the later seasons of the series (indicated by the promos pointing out that the series is in color). Finally, we have Elly's Critters Promotional Trailer (3:41). After watching this a few times, I'm still not quite sure what this is, but it seems to be some sort of pitch by Paul Henning (he narrates) to have Donna Douglas do a tour where she shows children different animals in nature. I'm glad that MPI released this... seriously. But it would be outright dishonest for me to say that this was a good movie. In fact... and this is something that I rarely say... was an awful movie. Even in the introduction provided by Linda Kaye Henning, you could hear her admitting that the movie was a nice thought, but very poorly executed (her own father was a bit harsher three decades ago in criticizing his own product). This movie was plagued from the get-go. There was a writer's strike at the time which interfered with Paul Henning's ability to work with the script, Max Baer refused to take part in the movie, Imogene Coca was Granny's Maw (huh? ), Werner Klemperer from Hogan's Heroes was (poorly) imitating Mr. Drysdale, and we didn't even get to see any interaction between any of the original members of Clampett family. This movie is an example of how everything can go wrong in a reunion movie of one of the greatest series of all time. But despite all of that, it is actually great to see this on DVD. I'd heard over the years how "awful" this movie was, but even so, I still wanted to see it for myself. Now, having seen it, I can fully disagree. 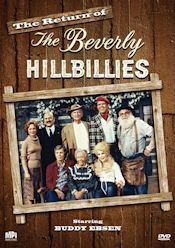 But I still think that it complements the collection of any fan of The Beverly Hillbillies, which was one of the funniest sitcoms to ever air on TV, and as usual, MPI has put together an excellent DVD in spite of the flaws of the movie. Who to Follow: Ed Asner (Twitter), "The official Ed Asner Twitter account. Actor, activist, warm, lovable, gruff, lefty, patriot are just a few of the words that would best describe me. " Claim to Fame: Ed Asner has been acting almost as long as some of the other legends of TV... but the early days were on stage. After a few TV roles in the '60s, Asner became even better known in 1970 when he was cast in the role of Lou Grant on The Mary Tyler Moore Show. Eventually, he even got his own spinoff, and in total, managed to score five Emmy Awards playing the role of Lou Grant. He later became president of the Screen Actors Guild, and still has plenty of desire to act left in him, including a recent role on Hawaii Five-0 where he played the same role that he played on the original version of the series, Hawaii Five-0. Why You Should Follow Him: Ed Asner is one of the greatest actors in TV history, and that alone is enough of a reason to follow him. But that isn't the only reason that you should follow him. Although he can be a bit controversial at times (in fact, he still claims that his political views are what caused CBS to cancel Lou Grant), he still has a lot to say on Twitter (especially since he doesn't have his own website... "wouldn't know what to do with one," he says), and is dedicated to his fans.